There are so many ways to use fake turf these days and save water and money at the same time! 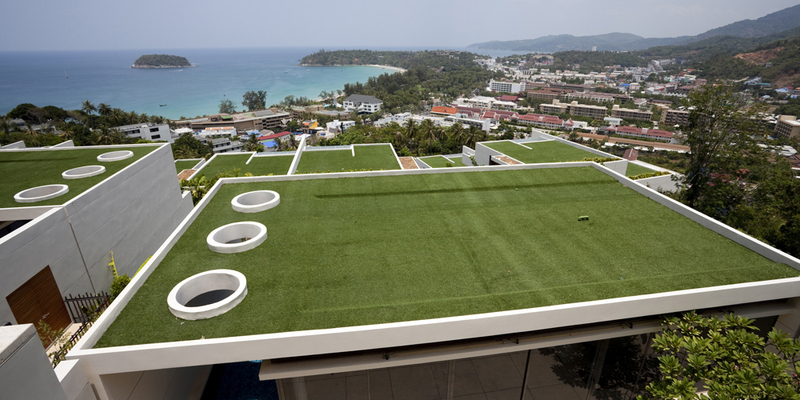 These days, turf installs have gone way past the bounds of yards and stadiums!One spot you may not have thought of for fake turf is a rooftop, so think again: this is a great way to dress up a roof space and have a pretty, green space in your business. Why not make your rooftop an outdoor living space by putting in nice, soft turf that you don’t have to water, mow, or feed? Another benefit to a rooftop turf install is that it does not require the support that real grass does, so you don’t have to do major construction to hold that weight. Watersavers can help you make your rooftop lush, usable, and pretty with our strong, low-upkeep, no-water products that are perfect for cool and breezy or hot and sunny days! Using turf for green roofs allows you to maximize your usable space, and the turf’s light weight also means that you don’t need to beef up your roof’s structural support, which real grass requires. Turf for green roofs solves a wide range of issues: it reduces sun reflection, conserves water, prevents injuries that can occur on real grass, helps prevent slipping, and remains puddle-free. It is also non-toxic and lead-free. Choose the safe, easy way to enhance your space; you’ll be so happy with the results. With have a wide range of fake grass types to choose from, and each can go a long way to making your roof a thing of beauty. Our best-quality products include the Sierra Super 94 (featuring a 94-ounce face weight, which means the blades are close together); and the Olive Plush 92, with a 92-ounce face weight. Our Natural 75 features a high face weight and a cost-saving standard blade, and the W Blade 60 has cool max technology that reflects sunlight. The Olive 51 and Emerald 46 are our value products, and they feature our usual great quality. Since it’s tough to judge what you would want to see on your roof by a picture online, we offer free, 1’ x 1’ samples so you can touch and see what you will be putting up there. If you’ve ever seen a “living wall,” you know that they a great way to soften urban settings and provide some green space. Turf for living walls is nice for walls, fences, or columns. You can dress up a commercial space in no time flat by adding it, as well as save water, money, and time. Nothing looks better than a splash of green on an old wall, and turf will not fade; the rain will wash it off, keeping it neat and lush. If you own a business, think about how easy on the eyes a wall covered in “grass” would be to clients. You can also mix turf for living walls with vines or other types of real plants for a great look. Did you know that natural green spaces can also create better work atmospheres? In fact, Reuters reported on a UK study that showed a 15% increase in productivity in “Lean” offices that have plants in them. Lean offices work under the assumption that pared-down spaces offer fewer distractions for workers, but the study says that nature space matters. Just think how much production would increase at work with a green wall or rooftop! And think how much your workers will love some realistic fake grass. To read more about what the study revealed, click here. Green Walls and Roofs—Just Do It! What are you waiting for? If you are a business owner and you want to pretty up your space, look into making a green wall or rooftop with fake grass. Watersavers has you covered with all types and grades of turf as well as any related tools. Whether you are looking to make a space better for workers or just have a pretty backdrop for clients, we can help you make the right choice for your needs and stay at the top of your game. Call us at 844-974-8873 or visit us online to find out more about your options and start planning your green space today!